PDF Download The solemnity of Jewish culture and tradition are depicted in this lovely, glowing menorah design. 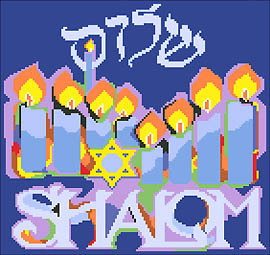 The Star of David is presented front and center and the traditional Hebrew greeting of shalom is featured. This design could be made into a Tallit bag or matzoh cover in addition to making a lovely picture or pillow. Contents: Stitch count 134w X 131h If stitched on 14 count finished size would be 9.5" wide by 9.25" high.